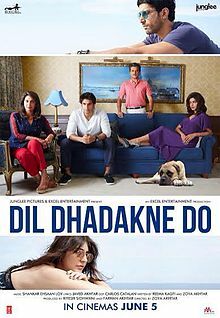 One new Bollywood film hits Chicago area theaters on June 5, 2015, and it’s a big one: Dil Dhadakne Do (“Let the Heart Beat“). Zoya Akhtar directs an ensemble cast that includes Priyanka Chopra, Ranveer Singh, Anil Kapoor, and Shefali Shah as a dysfunctional family on a cruise ship that also carries Anushka Sharma and Farhan Akhtar. DDD opens on Friday at the AMC River East 21 in Chicago, Regal Gardens Stadium 1-6 in Skokie, MovieMax Cinemas in Niles, Regal Round Lake Beach Stadium 18 in Round Lake Beach, AMC South Barrington 30 in South Barrington, Regal Cantera Stadium 17 in Warrenville, AMC Loews Woodridge 18 in Woodridge, and AMC Loews Crestwood 18 in Crestwood. Ticket demand is expected to be so high that the South Barrington 30 and Cantera 17 are showing DDD on multiple screens. It has a listed runtime of 2 hrs. 50 min. Tanu Weds Manu Returns gets a third week at all of the above theaters, except for the Crestwood 18. Piku gets a fifth week at the South Barrington 30, Cantera 17, and MovieMax, which also holds over Welcome 2 Karachi for a second week. The English-Hindi film Unfreedom — touted for being banned in India — also opens on June 5 at the Goodrich Randall 15 in Batavia. It has a runtime of 1 hr. 42 min. It is my least favorite film of 2015. Click here for a national theater list. Another release of note this weekend is the restored version of director Satyajit Ray’s The Apu Trilogy. The three Bengali classics start their run on Friday at the Music Box Theatre in Chicago. Click here for a national theater list. Other Indian movies showing in the Chicago area this weekend include Masss (Tamil w/English subtitles) and Pandaga Chesko (Telugu) at the Cinemark at Seven Bridges in Woodridge and MovieMax, which also carries Nee-na (Malayalam) and the Telugu movies Andhra Pori, Asura, and Rakshasudu. 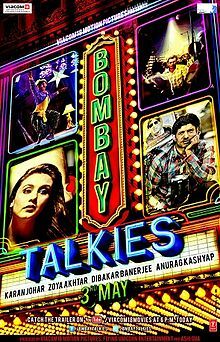 This entry was posted in Weekly Theater Updates and tagged 2015, Batavia, Bengali, Bollywood, Chicago, Crestwood, DDD, Dil Dhadakne Do, English, Friday, Hindi, Indian, June 5, Movie, Niles, Piku, Round Lake Beach, Runtime, South Barrington, Tamil, Tanu Weds Manu Returns, Telugu, The Apu Trilogy, Trailer, Unfreedom, Warrenville, Welcome 2 Karachi, Welcome to Karachi, Woodridge, Zoya Akhtar on June 4, 2015 by Kathy. The great road trip flick Zindagi Na Milegi Dobara is now available for streaming on Netflix. I really like both ZNMD and director Zoya Akhtar’s previous film, Luck By Chance, which is also on Netflix. Consider this a warning rather than a recommendation: Grand Masti debuts on Eros Now on Friday, October 11. This entry was posted in Streaming Video and tagged Bollywood, Eros Now, Grand Masti, Hindi, Indian, Luck By Chance, Movie, Netflix, Streaming Video, Zindagi Na Milegi Dobara, Zoya Akhtar on October 6, 2013 by Kathy. There were some good examples of familiar narratives — including the family drama Patiala House and the romantic comedy Mere Brother Ki Dulhan — but plenty of films pushed the envelope. Ra.One lead the Hindi film industry’s foray into 3D technology. Rockstar experimented with making a movie feel like an extended music video. The most successful experiments of the year were created by Aamir Khan Productions. The company released two intriguing films — Dhobi Ghat and Delhi Belly — with runtimes that clocked in at under two hours long, uncharacteristically brief for Indian movies. Further, the company insisted that the films show in theaters without the standard intermission break, paving the way for future success in international markets. 2011 was a tremendous year for women working in the Hindi film industry. Director Zoya Akhtar struck box office gold with Zindagi Na Milegi Dobara. Actresses Vidya Balan and Kalki Koechlin played gritty, compelling main characters in The Dirty Picture and That Girl in Yellow Boots, respectively. My favorite movie of the year also features a strong, complex woman as the lead character, in a story surprisingly macabre for Bollywood. The Best Bollywood Movie of 2011 is 7 Khoon Maaf. Talented director Vishal Bhardwaj puts his unique stamp on this dark comedy about a black widow and her seven husbands. In the lead role, Bhardwaj cast Priyanka Chopra, an actress who’s made a point of choosing a diverse array of characters throughout her career. Chopra manages to make the serial killer Susanna calculating yet sympathetic. Better still, the movie is often quite funny as the grim tale unfolds. 7 Khoon Maaf isn’t quite like any other Hindi movie released in recent years. Look past the dance numbers and cast of Indian A-listers, and it could easily transcend the “Bollywood” label — and instead be considered a “Foreign Film” (a genre with more critical cachet here in the US). The movie is available for streaming on Netflix, making it accessible to an audience who may have missed it in theaters early last year. If you haven’t seen 7 Khoon Maaf, I encourage you to check it out. This entry was posted in Articles and tagged 2011, 7 Khoon Maaf, Aamir Khan Productions, Best Bollywood Films, Best Bollywood Movie of 2011, Bollywood, Delhi Belly, Dhobi Ghat, Hindi, Indian, Kalki Koechlin, Mere Brother Ki Dulhan, Movie, Netflix, Patiala House, Priyanka Chopra, Ra.One, Rockstar, Runtime, That Girl in Yellow Boots, The Dirty Picture, Vidya Balan, Vishal Bhardwaj, Zindagi Na Milegi Dobara, Zoya Akhtar on January 11, 2012 by Kathy. I’m excited for this weekend’s new Bollywood release: Zindagi Na Milegi Dobara. Farhan Akhtar, Hrithik Roshan and Abhay Deol roadtrip through India, Spain and Egypt, meeting Katrina Kaif along the way. Akhtar produced the film, which is written and directed by his sister, Zoya, in her second effort after her terrific debut, Luck By Chance. Zindagi Na Milegi Dobara opens in the Chicago area on Friday, July 15, 2011, at the Big Cinemas Golf Glen 5 in Niles and AMC South Barrington 30 in South Barrington. It has a listed runtime of 2 hrs. 35 min. Given its stellar earnings of $1,232,610 in just two weeks in U.S. theaters, it’s no surprise that Delhi Belly is getting a third week at the Golf Glen 5 and South Barrington 30. Both theaters are carrying over Bbuddah…Hoga Terra Baap for a third week as well. Other Indian movies showing at the Golf Glen 5 this weekend include 3 Kings (Malayalam) and Deiva Thirumagal (Tamil). This entry was posted in Weekly Theater Updates and tagged 2011, 3 Kings, Abhay Deol, AMC South Barrington 30, Bbuddah...Hoga Terra Baap, Big Cinemas Golf Glen 5, Bollywood, Chicago, Deiva Thirumagal, Delhi Belly, Earnings, Farhan Akhtar, Friday, Hindi, Hrithik Roshan, Indian, July 15, Katrina Kaif, Luck By Chance, Malayalam, Movie, Niles, Runtime, South Barrington, Tamil, Trailer, Zindagi Na Milegi Dobara, Zoya Akhtar on July 13, 2011 by Kathy.